So here’s a quick tip I learned about making oatmeal that I wish I knew sooner. 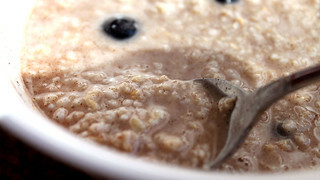 If you take the exact same amount of oats as you usually use (1/2 cup is 1 serving) and double the amount of water (2 cups instead of 1) and double the cooking time, you will end up with a bowl of oatmeal that is not only double the amount of volume but also a much creamier consistency. I find that when I make it this way, I have to let it sit for a bit after cooking to let the remaining water absorb into the oats. Then I add my ground flax, some vegan protein, a little bit of peanut butter and whatever else might be going into the bowl. Play around with the recipe until you find your perfect texture, but if you are the type of person that like QUANTITY, you will appreciate this tip! It is also a great tip for families on a budget, looking to stretch their breakfast dollar. Thanks to the Hungry Girl in the Kitchen, for this one! Hi Bonni! Can you elaborate on the “vegan protein.” That sounds very interesting to me. Previous Previous post: Never Give Up. No Matter What “They” Tell You. Next Next post: And the Genius Said….